The new U.S. energy policy of the Trump era is, in some ways, the oldest energy policy on Earth. Every great power has sought to mobilize the energy resources at its command, whether those be slaves, wind-power, coal or oil, to further its hegemonic ambitions. What makes the Trumpian variant — the unfettered exploitation of America’s fossil-fuel reserves — unique lies only in the moment it’s being applied and the likely devastation that will result, thanks not only to the 1950s-style polluting of America’s air, waters and urban environment, but to the devastating hand it will lend to a globally warming world. Other world leaders also boasted of their achievements in speeding the installation of wind and solar energy. Even the energy minister of oil-rich Saudi Arabia, Khalid Al-Falih, announced plans for a $30 billion to $50 billion investment in solar power. A possible explanation for this. Donald Trump’s indebtedness to the very fossil fuel interests that helped propel him into office. 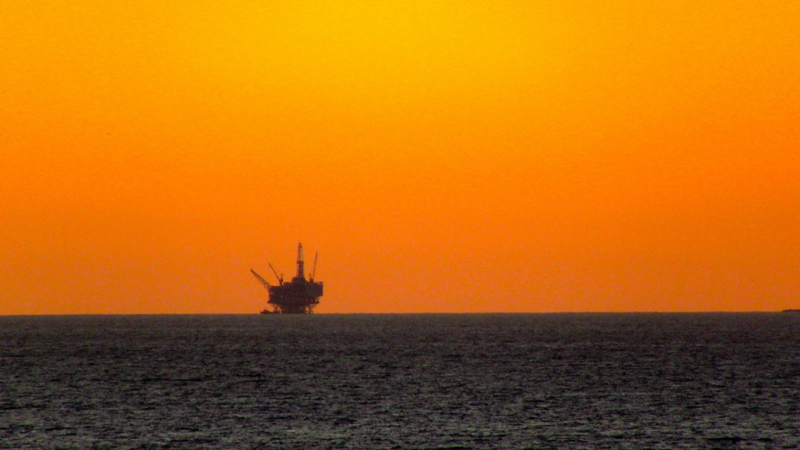 Think, for example, of his interior secretary’s recent decision to open much of the Atlantic and Pacific coasts to offshore drilling — long sought by the oil and gas industry — or his administration’s moves to lift restrictions on coal mining on federal lands, as long favored by the coal industry). Both were clearly acts of payback. Still, far more than subservience to oil and coal barons lurks in Trump’s energy policy, and Perry’s words. From the White House perspective, the United States is engaged in a momentous struggle for global power with rival nations and, it is claimed, the country’s abundance of fossil fuels affords it a vital edge. The more of those fuels America produces and exports, the greater its stature in a competitive world system, which is precisely why maximizing such output has already become a major pillar of Trump’s national-security policy. To Trump and his generals, we’ve been plunged into a world that bears little relation to the one faced by the last two administrations, when great-power conflict was rarely the focus of attention and civilian society remained largely insulated from the pressures of the country’s never-ending wars. Today, they believe, the United States can no longer afford to distinguish between “the homeland” and foreign battle zones when girding for years of struggle to come. From the onset of his presidency, Trump has made it clear that cheap and abundant domestic energy derived from fossil fuels was going to be the crucial factor in his total-mobilization approach to global engagement. In his view and that of his advisers, it’s the essential element in ensuring national economic vitality, military strength and geopolitical clout, whatever damage it might cause to American life, the global environment or even the future of human life on this planet. The exploitation and wielding of fossil fuels now sits at the very heart of the Trumpian definition of national security, as the recently released NSS makes all too clear. So, yes, the document does pay lip service to the role of renewables, though no one should take that seriously given, for instance, the president’s recent decision to place high tariffs on imported solar panels, an act likely to cripple the domestic solar-installation industry. What really matters to Trump are those domestic reserves of fossil fuels. Only by using them to gain energy self-sufficiency, or what he trumpets not just as “energy independence” but total “energy dominance,” can the United States avoid becoming beholden to foreign powers and so protect its sovereignty. That’s why he regularly hails the successes of the “shale revolution,” the use of fracking technology to extract oil and gas from deeply buried shale formations. As he sees it, fracking to the max makes America that much less dependent on foreign imports. It follows then that the ability to supply fossil fuels to other countries will be a source of geopolitical advantage, a reality made painfully clear early in this century when Russia exploited its status as a major supplier of natural gas to Ukraine, Belarus and other former Soviet republics to try to extract political concessions from them. Trump absorbed that lesson and incorporated it into his strategic playbook. In energy terms, what does dominant mean in practice? 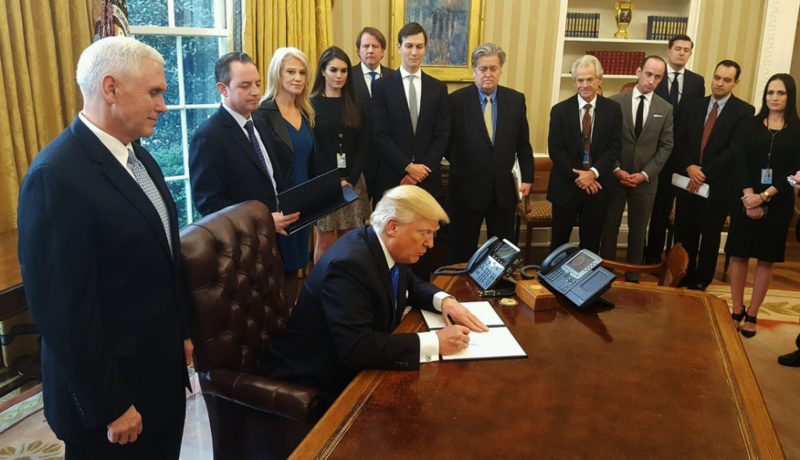 For Trump and his cohorts, it means above all the “unleashing” of the country’s energy abundance by eliminating every imaginable regulatory impediment to the exploitation of domestic reserves of fossil fuels. After all, America possesses some of the largest reservoirs of oil, coal and natural gas on the planet and, by applying every technological marvel at its disposal, can maximally extract those reserves to enhance national power. He then cited his approval of the Keystone XL and Dakota Access pipelines, the cancellation of a moratorium on the leasing of federal lands for coal mining, the reversal of an Obama administration rule aimed at preventing methane leakage from natural gas production on federal lands, and the rollback of Obama’s Clean Power Plan, which — if implemented — would require sharp cuts in coal usage. And from the recent opening of the pristine Alaskan Arctic Refuge to that of those coastal waters to every kind of drilling, it’s never ended. Closely related to such actions has been his repudiation of the Paris Accord, because — as he saw it — that pact, too, stood in the way of his plan to “unleash” domestic energy in the pursuit of international power. By withdrawing from the agreement, he claimed to be preserving American “sovereignty,” while opening the path to a new kind of global energy dominance. Never mind that the Paris agreement in no way intruded on American sovereignty. It only obligated its partners — at this point, every country on Earth except the United States — to enact its own greenhouse gas emissions reduction measures aimed at preventing global temperatures from rising more than two degrees Celsius above their pre-industrial levels. That is the biggest increase scientists believe the planet can absorb without experiencing truly catastrophic impacts such as a 10-foot rise in global sea levels. In the Obama years, in its own self-designed blueprint for achieving this goal, the United States promised, among other things, to implement the Clean Power Plan to minimize the consumption of coal, itself already a dying industry. This, of course, represented an unacceptable impediment to Trump’s extract-everything policy. The final step in the president’s strategy to become a major exporter involves facilitating the transport of fossil fuels to the country’s coastal areas for shipment abroad. In this way, he would also turn the government into a major global salesman of fossil fuels — as it already is, for instance, of American weaponry. Trump achieved many of these maximal-extraction objectives during his first year in office. Now, with fossil fuels uniquely imbedded in the country’s National Security Strategy, we have a clearer sense of what’s happening. First of all, along with the further funding of the U.S. military and of the “modernization” of the country’s nuclear arsenal, Trump and his generals are making fossil fuels a crucial ingredient for bulking up our national security. In that way, they will turn anything standing in the way of the extraction and exploitation of oil, coal and natural gas into obstructers of the national interest and, quite literally, of American national security. In other words, the expansion of the fossil fuel industry and its exports has been transformed into a major component of American foreign and security policy. Of course, such developments and the exports that go with them do generate income and sustain some jobs, but in the Trumpian view they also boost the country’s geopolitical profile by encouraging foreign friends and partners to rely ever more heavily on us for their energy needs, rather than adversaries such as Russia or Iran. As the Trump administration moves forward on all this, the key battlefield will undoubtedly be the building and maintaining of energy infrastructure — the pipelines and railroads carrying oil, gas and coal from the American interior to processing and export facilities on the coasts. Because so many of the country’s large cities and population centers are on the Atlantic and Pacific Oceans, or the Gulf of Mexico, and because the country has long depended on imports for much of its petroleum supply, a surprising share of existing energy infrastructure — refineries, LNG facilities, pumping stations and the like — is already located along those same coasts. Yet much of the energy supply Trump seeks to exploit — the shale fields of Texas and North Dakota, the coal fields of Nebraska — is located in the interior of the country. For his strategy to succeed, such resource zones must be connected far more effectively to coastal facilities via a mammoth web of new pipelines and other transport infrastructure. All of this will cost vast sums of money and lead to intense clashes with environmentalists, Native peoples, farmers, ranchers and others whose lands and way of life will be severely degraded when that kind of construction takes place, and who can be expected to resist. This is bound to provoke numerous conflicts with environmental groups and other inhabitants of what Naomi Klein, author of This Changes Everything, calls “Blockadia” — places like the Standing Rock Indian Reservation in North Dakota, where thousands of Native people and their supporters camped out last year in an ultimately unsuccessful effort to block construction of the Dakota Access pipeline. 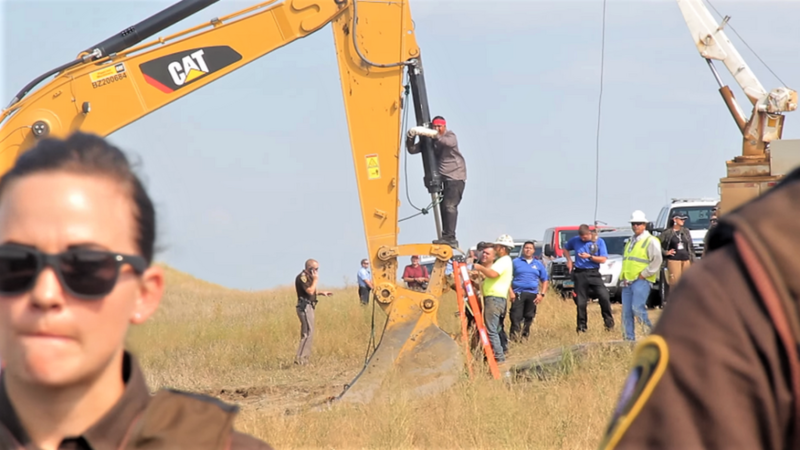 Given the administration’s insistence on linking energy extraction to U.S. security, don’t for a moment imagine that attempts to protest such moves won’t be met with harsh treatment from federal law enforcement agencies. Building all of that infrastructure will also prove expensive, so expect Trump to make pipeline construction integral to any infrastructure modernization bill he sends to Congress, thereby securing taxpayer dollars for the effort. Indeed, the inclusion of pipeline construction and other kinds of energy build-out in any future infrastructure initiative is already a major objective of influential business groups like the American Petroleum Institute and the U.S. Chamber of Commerce. Rebuilding roads and bridges is fine, commented Thomas Donohue, the Chamber’s influential president, but “we’re also living in the midst of an energy renaissance, yet we don’t have the infrastructure to support it.” As a result, he added, we must “build the pipelines necessary to transport our abundant resources to market.” Given the influence such corporate interests have over this White House and congressional Republicans, it’s reasonable to assume that any bill on infrastructure revitalization will be, at least in part, energy-focused. And keep in mind that for Trump, with his thoroughly fossil-fuelized view of the world, this is just the beginning. Issues that may be viewed by others as environmental or even land-conservation matters will be seen by him and his associates as so many obstacles to national security and greatness. Facing what will almost certainly be a series of unparalleled potential environmental disasters, those who oppose him will also have to contest his view of the world and the role fossil fuels should play in it. Selling more of them to foreign buyers, while attempting to stifle the development of renewals — and thereby ceding those true job-creating sectors of the economy to other countries — may be good for giant oil and coal corporations, but it won’t win America any friends abroad at a moment when climate change is becoming a growing concern for ever more people on this planet. With prolonged droughts, increasingly severe storms and hurricanes, and killer heat waves affecting ever-larger swaths of the planet, with sea levels rising and extreme weather becoming the norm, the urge for progress on climate change is only growing stronger, as is the demand for climate-friendly renewables. Trump and his administration of climate-change deniers are quite literally living in the wrong century. The militarization of energy policy at this late date and the lodging of fossil fuels at the heart of national security policy may seem appealing to them, but it’s an approach that’s obviously doomed. On arrival, it is, in fact, already the definition of obsolescence. Michael Klare is a professor of peace and world security studies at Hampshire College and the author, most recently, of The Race For What’s Left. Follow him on Twitter at @mklare1. He is currently completing work on a new book, All Hell Breaking Loose, on climate change and American national security. This story originally appeared at TomDispatch.